I don't get to play with the Mojo Monday sketch and as you can see it was finally on Tuesday that I got the card posted to!! I did play with the sketch on Monday but it was too late to get it written up in time to be posted on Monday. So I just left Herbert for my Monday post and moved the Monday sketch over to Tuesday. This was a fun sketch. I really liked the two panels. There was something about them that made me want to play with this sketch. I used the "Fruits & Flowers" set. I have had this set for a little while now and have not used it. I have also had the Pool Party card stock and have not yet played with it either. Or the ink or the decorative paper I bought. I was removing a lot of plastic wrappers to make this card!!! I have other plans for the stamp set but I did like this flower in it for Monday's sketch. It fit the area without having to adjust the sketch to fit my stamps! This was a fun sketch and I can see myself using it again. If you have time give it a try. I love having these sketches on hand so I can change my layouts. I tend to get stuck using the same few over and over, except for once a week when I do the SplitCoastStampers Sketch Challenge. And now and then the Mojo Monday sketch. I wish there was one for every day of the week. Imagine how much fun that would be with all that variety?? 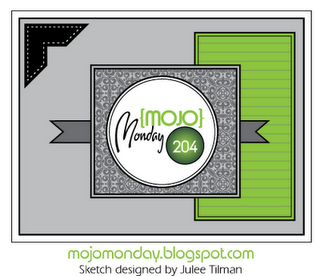 Your card is gorgeous & you did great with the Mojo sketch! TFS!! !